Why You Need A Backup! It’s a great day at work, you’re just cruising through your daily tasks amazed at how productive you are then your computer screen goes black. For a split moment panic sets in and you think, what happened? You realize the machine isn’t running so you try to restart it but nothing. You call your IT company for help and they quickly determine your hard drive has failed so then they ask…. “You did back your drive up, correct?” Is that the moment you feel that knot in your stomach because you knew you should back up your system, but you haven’t done it in a while or at all? We all know we need to backup our computers, so why don’t we do it? There are a lot of reasons for not doing backups including time & cost but there are even more reasons why you should. So, the question becomes, what is stored on your computer or server that can’t be replaced? How will that impact your ability to run your business or manage your home finances? Pictures, customer data files, blueprints, proposal drafts, billing information, QuickBooks and maybe your kids’ homework? When you look at how we rely on our computers to help run our businesses and homes, the loss of data could be catastrophic! As part of any backup solution, Helping Hand IT recommends having some type of automated backup in place. I started this article as if the hard drive failed. Reality is every hard drive will fail sooner or later. Are you prepared for that? That is not the only concern though. There are other events that could cause loss of data and effect your ability to conduct business. Every day we deal with fires, floods, theft, accidental damage, accidental deletion, viruses and malware attacks. All these things could be catastrophic to running your business without backup data. There are companies that specialize in data recovery from damaged hard drives. They are expensive and not always successful! The cost can easily run into thousands of dollars for a recovery. Now we know the why we need a backup solution, let’s look at some of the ways you can back up your data. There are physical back up devices that connect directly to the server or your computer which we refer to as external hard drives. Many of these devices communicate through a USB cable connection. These types of backups are good for home systems or as part of a larger backup solution which is illustrated below in the drawing. For larger systems with more data and for those looking for a more robust backup solution there are NAS boxes- Network Attached Storage. There are many brands of NAS boxes and Helping Hand IT recommends the Synology brand, known for ease of use and reliability. These types of devices offer much larger amounts of data storage capabilities with built in redundancies. Backup storage devices can be set up in different configurations built for speed, redundancy or both. This configuration flexibility allows customization for different types of businesses. In addition to physical backup devices you have cloud options for back up storage. Many of these options offer inexpensive data storage for large quantities of data. This type of solution could be part of your over-all backup solution. When data is critical to the life blood of a business, most companies will use a combination of on site and cloud storage for data backup. Redundancy is your best bet for preserving your data in a worst-case scenario! Look at the drawing below to see some examples of different backup solutions. Note: Veeam software is our recommended back-up software solution but not the only choice. With the many advantages the Veeam software offers, it is hard to recommend anything else. Similarly, the Synology back up devices are our recommended device for most clients, the drives can be configured in several different arrays built for redundancy, speed or both. 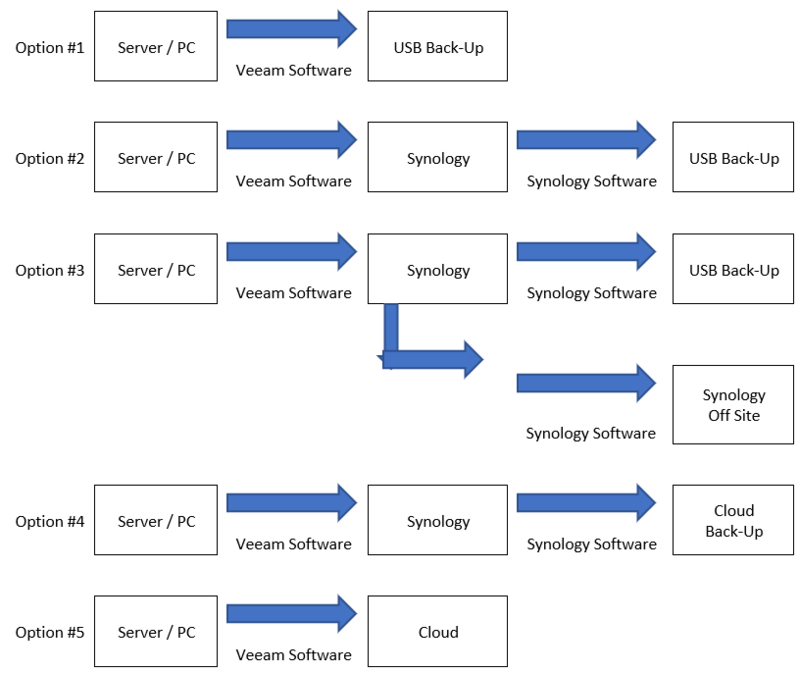 We use the Synology back up built in software to transfer data to an additional backup such as a cloud option. If you are ready to find out what would be a good solution for your system, just give us a call. We will be glad to do a free analysis of your current structure to help you put a backup plan in place! DON’T wait till it’s too late. Take action and protect your personal, company’s and your clients’ information! To take advantage of our FREE network and security assessment just call us today at 630-940-1718.